How weird is it to get excited over gas station pizza? I’m not even gonna lie. 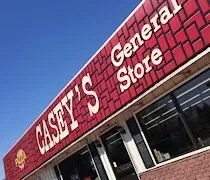 I really miss Casey’s General Store. When J and I worked in Creve Coeur, IL (right outside Peoria), there was a Casey’s right down the street. Whenever we didn’t have time for dinner, we’d stop at Casey’s and grab a couple of cheap slices to eat while on the road. Unfortunately, Casey’s hasn’t reached Michigan. The closest location of the Iowa based chain of gas stations is in Elkhart, IN. Even when we go home for a weekend, there aren’t many Casey’s that we pass. They are much more common in the central part of Illinois than in the northern. Outside of one in Peotone, IL just off I-57, I’m not sure where there would be one that we pass near Chicago. My mom’s hometown has one though and this trip home included a family gathering in the small Village of Cullom. I didn’t grow up in a very big town. At the height, population was 800 (not a typo), but Cullom beats even that with a whopping 563 people in the last census. As far as food options, there’s Casey’s and a bar on Hack Street which is the main downtown area. Our family get togethers always involve a pot luck, but just for nostalgia’s sake, J and I decided to stop at Casey’s on our way out of town. We both needed a drink for the drive back to Michigan anyway and since we were there, how about some pizza. 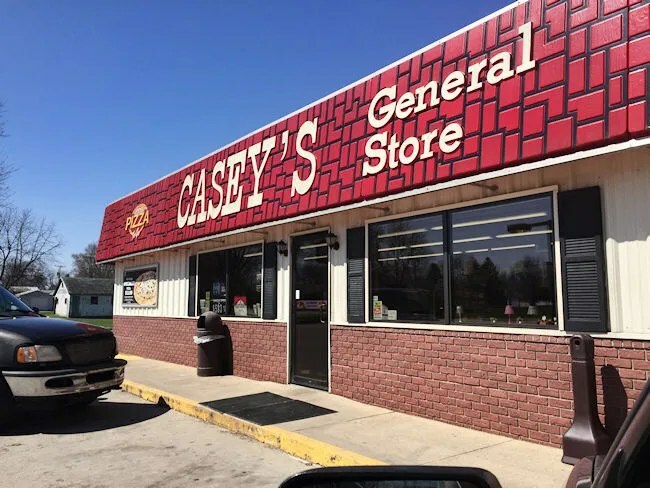 Casey’s General Store in Cullom is on Jackson Street which is also Illinois Route 116. Let’s be honest here. Casey’s is a gas station. It looks like gas station. It sells gas, cigarettes, pop, and snacks like any other gas station. If you didn’t know any better, you’d also think they have the same run-of-the-mill kitchen that many gas stations try to have, but there’s something that makes it better. 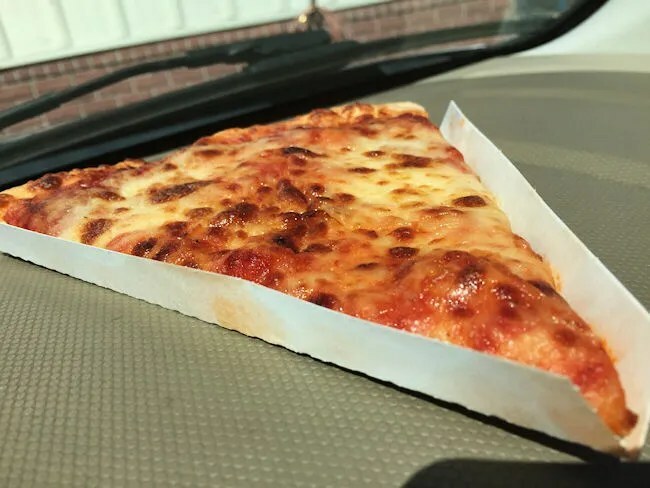 You can always order off the full menu when the stores open and you can even order online, but they typically have pizza slices in the rotating warmer and some warm snacks under heating lamps. Think Speedway…but better. I grabbed a slice of cheese pizza for J and a slice of pepperoni for myself. 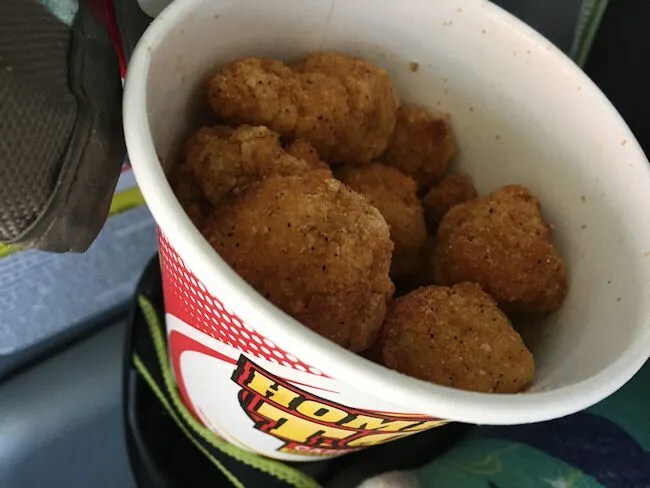 I also picked up a cup of popcorn chicken for L. As for those drinks, J wanted a fountain Pepsi while I prefer the 20 oz. bottles so I grabbed one of those for myself from the cooler. The cost for our little snack was just under $12. Casey’s pizza is hard to describe. It’s a thin crust pizza that’s usually not very crispy and also can be a little greasy. Honestly, though, that grease it is what makes it delicious. They aren’t using the freshest ingredients and it’s not anywhere near a gourmet pizza. Heck, even most delivery places have a better looking more complex pizza than Casey’s, but there’s something about cheap, delicious pizza that I long for on so many solo road trips around Michigan. The popcorn chicken wasn’t really hit with L, but she’s been such a picky eater lately. We should have gotten her a slice of cheese pizza as well, but I was afraid of her trying to eat it in the car. I wasn’t super hungry, but I snacked on the chicken, which I found to be on par with any fast food chain nugget, as we drove back north. Casey’s General Store is so hard for me to describe. Maybe it’s just the nostalgia. Maybe it was born out of necessity. I don’t know. What I do know is that it’s hard for me to pass up a Casey’s when we travel near one. Even if it is just for a taste of nostalgia, that nostalgia is damn tasty.